Spring is very much in the air. In fact summer is making a strong bid to knock spring off its perch already! Spring means animals getting more than a little randy, and this pair of Common toads are doing what comes naturally. Actually they're not in the act itself, but are engaging in a special hold where the male hitches a ride on the female for a few days, known as 'amplexus'. These particular toads were seen in CenterParcs, Sherwood forest (more from there over the following days) where they were frankly abundant, with plenty of their fellow toads to be seen squashed on the road. The perfect page on toads, where I learnt about amplexus and many more interesting things is to be found at herpetofauna.co.uk. And for my parting shot, is this "doing it froggy style"? The natural world is springing up around us so it's an exciting time to watch it grow. Here are a few things I have noticed of late. Bees are out in force, both bumble and honey. Lacewings seem to have been particularly numerous compared to previous years. I've seen loads of them in various buildings in various parts of the country. I saw my first butterfly of the year: a Comma, which overwinter as adults to emerge in March. Daffodils are everywhere, whilst snowdrops are almost completely done. Birds are noisily celebrating. Magpies in particular seem to be building nests as I see them flying with twigs, but I imagine many species are doing so. 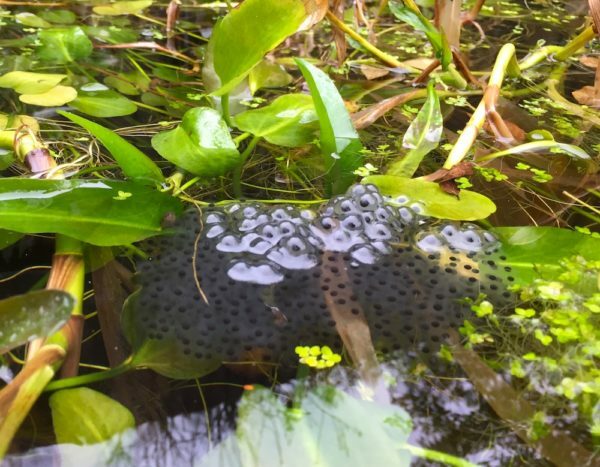 Ponds are full of frogspawn (pictured), and presumably other types of spawn. The BBC reports on a survey of UK reptiles and amphibians that suggests numbers of most are in decline. Adders, toads, lizards and pretty much everything else apart from Palmate newts are seemingly struggling since 2007 when the surveying began. I'd illustrate this article with a picture of an adder but I'm afraid I've never seen one let along photographed one. It sounds like my chances are shrinking.